Creativity is one of the most valuable traits you can ask for in a employee. It unlocks ideas and introduces different ways of working which can all have a positive impact on the culture of your organisation. There are many ways to get your employees’ creative juices flowing, but looking at your workplace and the technology contained within it, can be a great place to start. We lead by example in our new 5000sq ft. WorkLife showroom in Manchester’s Neo. We have created lots of diverse areas within the space to give you an idea of how new technologies impact on the changing nature of work. 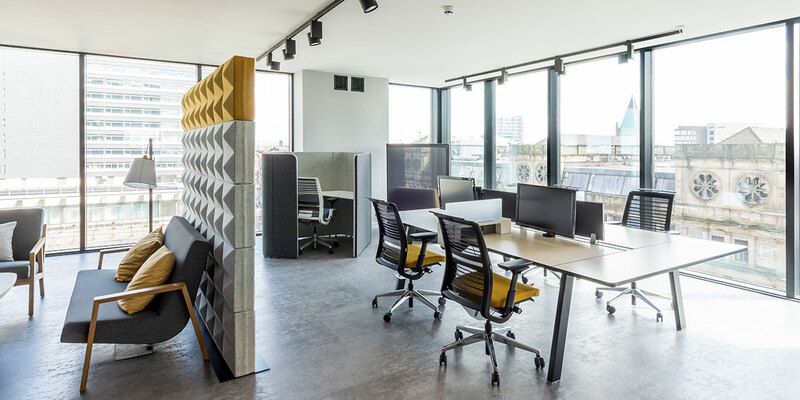 There is an increasing demand for innovative workspaces in the UK. Today’s businesses are looking for an increasingly collaborative way of working. At our Worklife showroom in Neo, you can see a range of workspaces from co-working areas, event spaces, and private areas, a communal lounge and kitchen. The showroom also features panoramic views across the city. Neo provides innovative technology solutions and support services for all sectors, including the creative, media and digital industries, as well as the more progressive, creatively-minded businesses seeking a flexible and collaborative approach to the way they work. Find out more about the high-tech products that we can provide at Penketh Group, below. Are you looking for a way to get your team working well together? media:scape gives your employees the space and tools they need to enhance productivity, collaborate efficiently and produce their best work. It allows information to be shared quickly and effectively between teams, no matter what the format. As workers become more mobile, media:scape’s state-of-the-art technology means that sharing information is as simple as opening up your laptop, attaching one cable and hitting a PUCK to share and view content instantly. Is your boardroom looking a bit tired? The impressive Clickshare is a meeting facility that encourages collaboration. 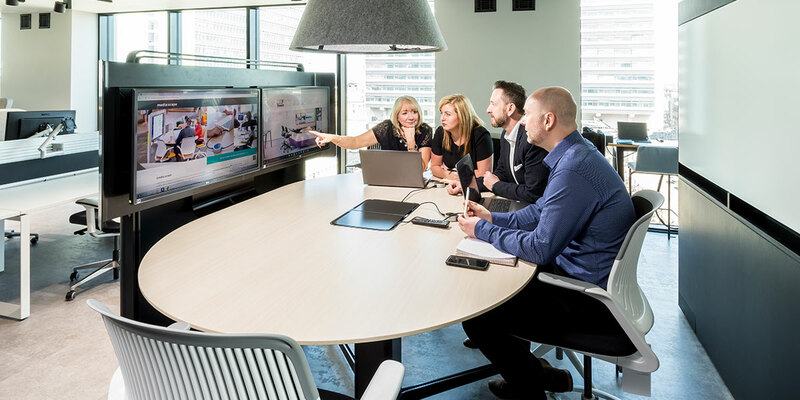 With Clickshare, staff can plug into technology that allows them to work seamlessly with colleagues from one screen. It’s quick to set up and super simple to use, connecting up to 8 people in one meeting. 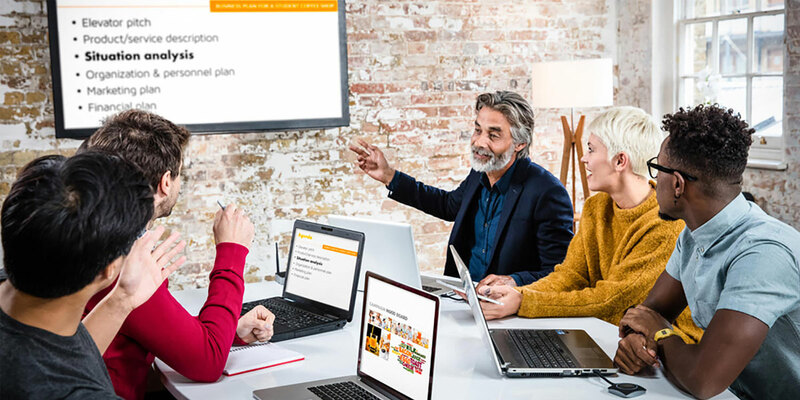 With no software to be downloaded, employees can simply connect via the ClickShare app. The intuitive SMARTboard is an impressive piece of technology that allows staff to collaborative via interactive displays. 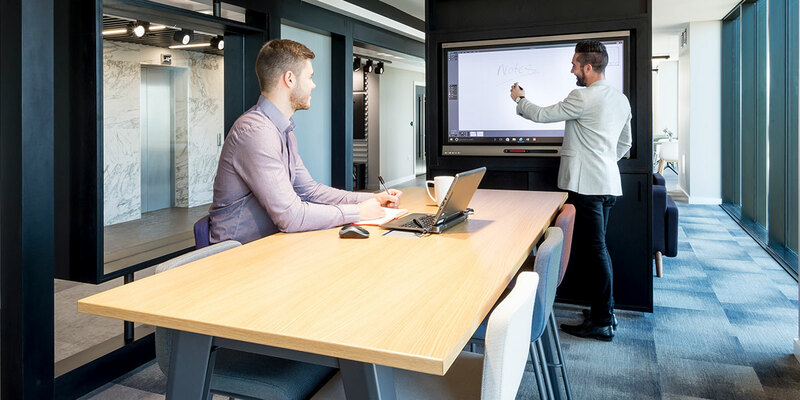 Ideal for brainstorming, wireless screen sharing or even accessing the embedded web browser – all this and more is possible from this SMART screen. The SMARTboard is a great tool for keeping workers engaged whilst creating innovative solutions. The display is controlled using your hands – write, touch, pinch or swipe to achieve the desired action. A range of formats are also available, including PDFs and JPEGS, meaning you can save and organize your notes from all sorts of devices. It is even possible to connect a guest PC or other multimedia device to the display. With all the will in the world and taking all of the above into consideration, if your employees cannot find a space easily and quickly to work in, vital time is lost. Why not consider – Reserva a state-of-the-art digital booking system that gives full visibility about meeting room availability and can be dynamically linked up to your calendar. Reserva is an intuitive piece of software that ensures meetings can be booked, extended, shortened or cancelled, all from the interactive touchscreen. The system’s ‘check in’ function also helps to manage ‘no shows’, thus improving the day-to-day efficiency of the business. For more information about integrating technology within your workspace to improve creativity, speak to one of our experts.